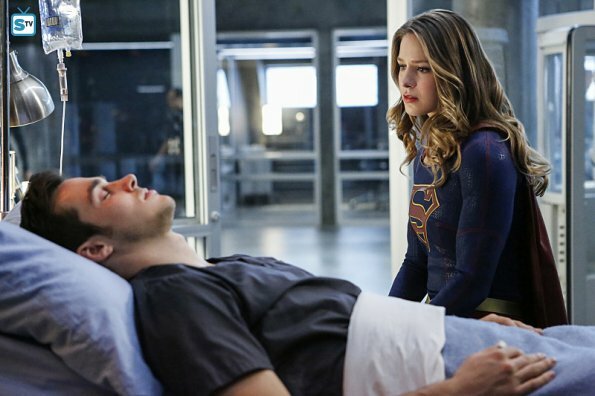 Cyborg Superman unleashes a deadly virus called "Medusa" at the alien bar that kills all of the aliens except Mon-El, who becomes ill. Kara learns the virus came from Krypton and Cadmus plans to disperse the virus over National City. Mon-El has easily become one of my favorite characters. He's such a dork, and he's showing a lot of growth. This episode especially made me love him more; he was such an awkwardly adorable baby. He brought stuffing--actual pillow stuffing--to Thanksgiving dinner. (I'm still crying.) And then! Then he kissed Kara! (*runs around house screaming*) I was so happy. I ship them so much. But then... Kara denies it (and tells him he drooled--what is this Percy Jackson? ), but he knows. He knows she was lying. I can't handle it. He looked so sad. Poor baby. The fight between Cyborg Superman and J'onn was so fun. It was an epic showdown I didn't know I wanted. The ending was a bit cheesy with Kara saying he might be a Cyborg but he's no superman, but we'll forgive the writers. Of course, though, he got away. He'll be back. It's always a treat for Mama Eliza Danvers to visit. (I mean, she is Supergirl, after all.) Not only is she sweet and kind, but she's insanely smart. She finds a cure not only for the Medusa virus but to save J'onn from turning into a White Martian. She also had the perfect words for Alex, who is still a bit nervous about coming out. It was a wonderful mother-daughter moment, and I'm grateful this show has been so full of love and acceptance this season about many issues. Kara showed a lot of strength and determination this episode. She didn't give up, and she worked hard to help save the city and her friends. Not only does this show treat people equally and respectfully, accepting all, but it empowers women, which is why it's still one of the most important shows for superheroes. Between Kara, Lena, Alex, and Maggie, this show rocks the women power. Cyborg Superman is a big meanie. He's creepy and ruining lives, and I don't like him. He continues to become more and more Cyborg, which is interesting. And of course, he ran off again. Come on! But I have to give David Harewood a shout out for doing a great job with both roles. He nailed it. This virus was scary. It was so sad to watch all those aliens die. The aliens that survived are going to have a hard time feeling safe there or anywhere in the city again. It's painful. But it's also a little... strange. If the virus attacks non-Kryptonian physiology, wouldn't it also attack humans if it was unleashed? Or are humans close enough to Kryptonians (like Daxomites are) that they would only get sick? Cadmus didn't really do their research, it seems. And I also don't know why they limited themselves to just attacking National City. Why not the whole world? Who are these people searching for Mon-El? What do they want with him? Don't you dare take him away from Kara! No, I will refuse. Overall, this episode was a solid Supergirl episode. It continued a lot of what has been building up this season so far, giving us a few answers and reassuring us that Kara is not alone in the world. While I wanted a few things to be different (Kara's reaction to Mon-El, the crossover, etc. ), I did enjoy it. It was exciting, and I can't wait to see what's next for Supergirl in January! What did you think of "Medusa"? How do you feel about Kara and Mon-El's kiss? I really want the two of them to be together, Its like Romeo and Juliet, but better. But the fact that Kara denied the kiss, puts me on edge because she doesn't seem like she likes him.